Free Tickets to ASLAN 2019. Meet Sipwise on Stand 87! “Enabling Digital Transformation” – at ASLAN 2019. The congress focuses on the latest trends, ranging from hybrid cloud systems to security and artificial intelligence. Sipwise offers different solutions for the Spanish market. With the turn-key and carrier grade VoIP system, the product C5 Softswitch supports different types of access technologies such as Cable, xDSL or Wifi, and makes real-time communication possible. Supplemented with further products of Sipwise such as Cloud PBX or WebRTC, Sipwise provides companies with an aligned solution of various user needs. For those who want to enjoy the GOLDEN access to this event, worth € 200+ each, Sipwise is happy to upgrade your tickets. Interested? Send an email to sales@sipwise.com. *Disclaimer: limited amount of Golden Tickets. 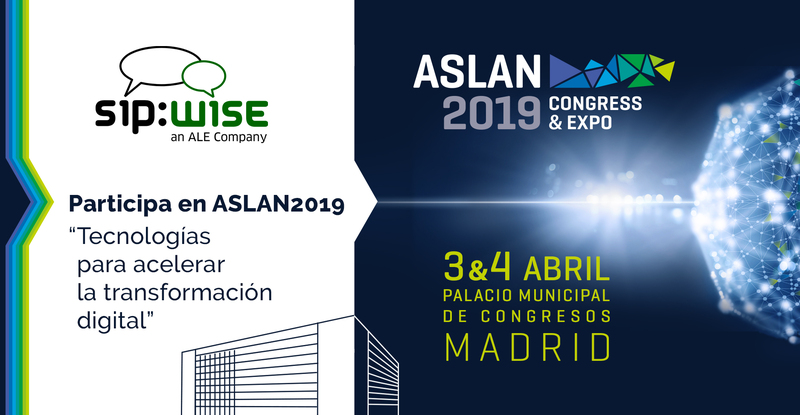 Sipwise ‘s Business Development Manager responsible for the Spanish market, Rute Sacramento, will do a conference at the Cloud & Innovation Area. “As per James Redfield’s famous quote: ‘History is not just the evolution of technology; it is the evolution of thought’. This is the motto for the conference, and it is going to help our customers understand the importance of investing in Sipwise´s new and sustainable technology and how it can impact their businesses in terms of growth and profit.” Rute explains. For the schedule, please check ASLAN’s program page. With many years of expertise in VoIP and UC solutions, Sipwise works with clients on all continents and is servicing over 65 Telcos in 25 countries worldwide. Sipwise offers an unbeaten price-to-performance ratio to communication service providers, with ease of integration towards their technical, OSS and BSS infrastructure, as well as outstanding flexibility.